The British Beekeepers Association says the average yield per hive in England and Wales was down by 2.3lb (1kg) this year from the previous year - and numbers have been dropping for decades. 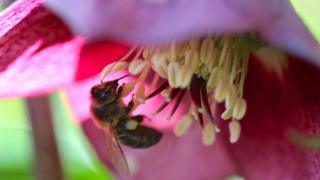 The BBKA says people can help bees by planting the right sorts of flowers. South-west England had an average honey crop of 17.7lb (8kg) this year, while in Wales it was 17.8lb - well below the English average of 23.8lb (12kg) per hive. Both regions suffered particularly wet summers. While weather can cause fluctuations in honey yield, however, the BBKA says it is the continuing overall decline in quantity that is most worrying. "A honey crop of 50-100 lb (22-45kg) was typical when I started beekeeping in the 1950s," said John Hobrough, a beekeeper of 60 years. "In those days, farmers under-planted crops with clover to nourish the land. Nowadays there just isn't time or space for this style of farming. "I think it is having a huge impact on the honey crop, by reducing the forage available not just to honeybees, but all our insects." South-east England was the most productive area, yielding an average of 30.1lb (14kg) of honey per hive. Hives in suburban gardens or other areas did better than those in rural areas, producing 27.5lb (12kg) of honey on average compared to 22.5lb (10kg). The survey also revealed that 62% of beekeepers were most worried about the use of pesticides, while 31% were worried about agricultural development reducing forage. Margaret Murdin, BBKA chairwoman, said: "Everyone can play a part in helping honeybees and all the other insects they love such as butterflies and bumblebees by planting the right sort of flowers and shrubs. "A crocus is so much better for bees than a daffodil, for example. "Our survey shows that suburban gardens and urban roof tops produce some of the best honey crops, so how we garden really can make a difference."